Thousands of people every year fly into Changi Airport and head for the centre of Singapore without even giving the area of Changi a second thought, but this eastern sector of the island is steeped in history which is worth spending a little time in pursuing. In the early 1900's Changi was little more than a low-lying mangrove swamp area which was punctuated by three main hills that were destined to become known as the Battery Hill, the Fairy Point Hill and the Temple/Changi Hill areas. Surrounding these hills was a thick undergrowth and virgin forest with trees up to 150 feet high. The name 'Changi' is the native word for the 'Balanocarpus' tree, some of the tallest trees that used to grow on Singapore. By 1927, the only habitation in the Changi region was a small native village, a police station, a couple of bungalows, one being government owned and a small Japanese Hotel with a dubious clientele. Any military protection that was set up by the Government to defend the island during the First World War covered the harbour area only. The strategic importance of Singapore as a military base had been realised by Sir Stamford Raffles, many years previous, but in the early days it was not considered necessary to build fixed defences around the whole island. As Japan flourished into a powerful nation in the Far East, Stanley Baldwin made the decision to build a gigantic Naval Base on the north coast of the island. It was thought, quite wrongly as it turned out, that any possible attack would come from the sea and the possibility of a land attack from the north was ruled out. 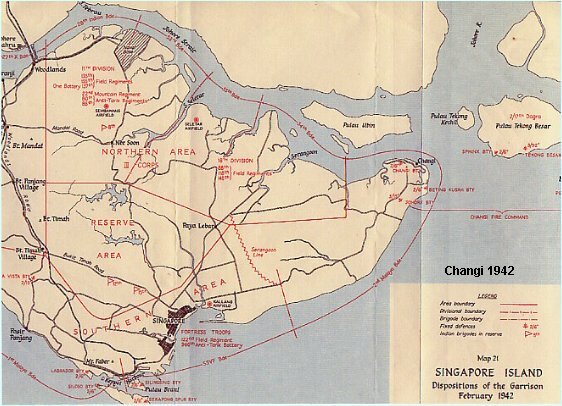 In the overall scheme of things it was decided that Changi would be the base for the Royal Artillery batteries to cover the eastern approaches to the Johore Straits. In 1927 the Army Council sent a commission of three officers, headed by Major General Webb Gillman to prepare a detailed defence scheme and considering that the whole area was virgin swampland and jungle, the task that lay ahead of them was a formidable one,but despite the drawbacks the scheme went ahead. This included the rough plans of the Changi cantonment (a small division of Changi Island) which had been prepared previously at the General Headquarters, Fort Canning, the previous year. Blueprints were prepared for two main barrack areas which were later to become known as Kitchener and Roberts Barracks and in no time at all work on clearing the ground commenced. One very important aspect was to drain the mangrove swamps and destroy the ever present malarial mosquitoes as it was essential that they could not breed within half a mile of any of the living and working areas. Snakes were the second most dangerous hazard and were a constant danger until eliminated. The initial clearing was started by two supervisors and eighteen labourers, but as land was cleared and temporary living accommodation and pathways laid down, more workers were able to be brought in. By December 1927 the first four officers married quarters on Fairy Hill Point were almost complete, followed by similar quarters on Battery Hill. The first three years in the evolution of Changi saw it rise up from the swamps and the foundations of its future development were well and truly laid. Thought was even given to the horticultural enthusiasts. Many of the large stately trees were left standing and worked around, other flowering trees and shrubs were established and although Changi was first and foremost a Military base it also became an area of great beauty. Unfortunately by the middle of 1930 all work on Changi came to an abrupt halt. Although the defence of Singapore was becoming increasingly urgent in the face of Japan's growing urge to become more powerful than its neighbours, back in England the political and economic situation demanded that money being spent on Singapore defences be cut. However, with a change in Government and Japan's intentions growing stronger, the work on Changi continued again in 1933. Between 1934 (when the India Barracks were built) and 1941 the work continued in earnest and by 1936 most of the barracks, married quarters and officers mess were completed. The Royal Engineers took over the Kitchener Barracks and the Royal Artillery Coast Artillery Regiment occupied the Roberts Barracks as more barracks and quarters continued to be built. In 1936 a new site was selected to house a full battalion of infantry at Selarang about a mile from the Roberts Barracks and in the next two years the whole of Selarang Barracks was established and became the home of the Gordon Highlanders. Also built in 1936 in Changi village was a new civilian jail to house up to 800 civilian prisoners - this jail was to feature very dramatically when Singapore fell to the Japanese six years later. Further new barrack blocks and a NAAFI carried on being built as late as 1941. A week before the capitulation on 15th February 1942, the Japanese were occupying Palau Ubin, overlooking Changi and heavy bombardment was exchanged. But defeat was inevitable and within hours of the surrender the Japanese decided that the Changi area and all the barracks would become one huge prison of war camp. It is not widely known that the civilian Changi Prison was not used initially to house the thousands of servicemen who became military POWs. Instead it was the surrounding area outside Changi and the nearby barracks that became the home of the dejected and disheartened prisoners. For some it was to be this for a few months, but for others it was for the full duration of the war. The 18th Division, which had landed in Singapore only weeks before the capitulation, were thrown immediately into the battle and now found themselves in two barrack blocks and several huts of the India Barracks. Many Dutch and RAF prisoners taken in Java and later sent to Singapore were housed in tents close to the India Barracks and this area was known as the Java Lines. 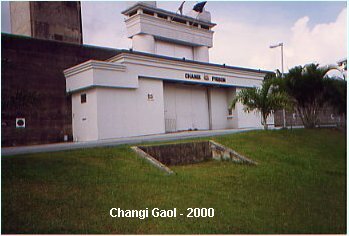 Changi prison itself and its bleak stone cold cells designed to take 800 prisoners, now became the home of the, mainly white, civilian internees - 3000 men and 400 women and children. For two years they endured nightmares and brutality within the prison's stone walls until May 1944 when they were ordered out and given a change of residence. From early 1944 thousands of prisoners had been returning to the Changi area following the completion of the Thai/Burma railway. The civilians were then moved out of Changi Jail into the Sime Road camps. 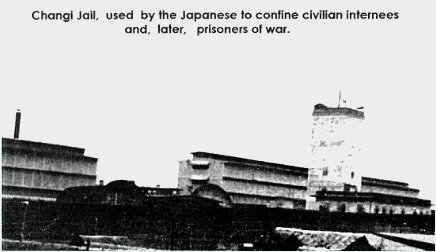 Following the evacuation of the civilians, 5,000 POWs were moved into the prison and its cold, foul smelling cells. Each cell, crawling with bugs, was approx 6ft x 8 ft and had a concrete block in the centre which served as a bed for one prisoner. Two more prisoners slept on the floor on either side. One small window approx. a foot square gave a little light and the much needed fresh air while a hole in the floor in one corner served as a toilet. A further 12,000 POWs were concentrated in the surrounding area of the jail, living in camps made up of attap huts and rough accommodation. The Outram Road Jail was used as a punishment camp. POWs were sent out from Changi every day to work in different locations on the island. Many worked on the Paya Lebar air field and others, mainly from the Bukit Timah camp, were sent to the centre of Singapore to build a Japanese shrine (which was later demolished at the end of the war). In the first early weeks following the capitulation, the Japanese placed no restriction on the movements of any prisoners within the Changi area and they were allowed to walk about at will over the whole eastern end of the island - until 12th March 1942, when the Japanese started to limit the activities and freedom of the POWs. 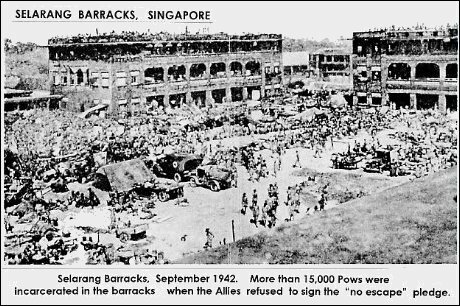 In September 1942 came the 'Selarang Incident' when 15,400 men were concentrated at the Selarang Barracks for refusing to sign a declaration that they would not try to escape. The POWs held out for three days but eventually the British and Australian commanders ordered their men to sign the declaration, pointing out that failure to do so would result in hundreds of very sick men dying of disease in the squalor, heat and unhygienic conditions. After the men signed on the 5th September they were allowed to return to their normal places of captivity. By the time the Selarang Incident was over the number of prisoners who had been taken to Changi originally, seven months earlier, now numbered less than half. Many had died of hunger and disease and many more had been taken to other destinations to be put to work as slaves. As already mentioned, many POWs from Changi were forced to labour for two years to build the Paya Lebar air strip for the Japanese, whose planes first started using this in 1944. The work was hard and laborious in the searing heat as the men slaved, excavating soil and rocks and filling hand trucks. These in turn were then manually pushed to the flat, low-lying swampland to fill the ground and form the air strip. In gruelling heat, working ten to twelve hours a day, suffering from starvation and many deficiency diseases, the men daily succumbed and the death rate continued to soar. The barracks nearest the air strip were used as aircraft workshops and stores, but by this time the news was leaking through of the German surrender and those back in the jail, with well-hidden secret radios, were constantly picking up news that the days of the Japanese occupation were drawing to a close. On the 15th August 1945, an unconditional surrender was announced and almost immediately POW working parties began returning to Singapore from other destinations, eager to return home. By early September over 17,000 men were congregated in and around the Changi jail compound and at the same time medicines and medics were parachuted in to assist the suffering men. For over sixty years the name Changi has remained synonymous with hardship and cruelty, borne during this horrific chapter in British military history, a name that will not easily be forgotten. It will remain a lasting bitter memory to all those who were unfortunate enough to have been interned in the miserable foulness within its formidable stone walls or in the surrounding camps within its shadows. Today the area around Changi and the nearby village is far removed from the stark Changi of sixty years ago. To reach this eastern corner of Singapore, one has to drive along beautiful clean, tree-lined roads, bedecked with exquisite flowers and colourful shrubs. Thousands of bougainvillaea flowers, growing in abundance, bask in the dazzling sunshine, throwing a lilac cloak over everything within its grasp as if trying to purge itself of the dark and evil force that once occupied this small island. 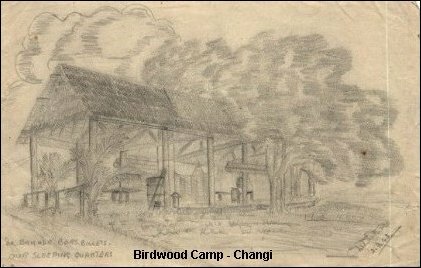 As already mentioned, the word Changi is a tribal word for tall trees, but today the word could well take on another meaning which is far more familiar to everyone - The Far East Prisoners of War.